I arrived in Japan last week for the summer. As usual, I will be doing research on my various current topics (contemporary Japanese film, Japanese film theory, etc. ), but I will also be teaching a course on Japanese cinema for the Summer Session at Yale. The class will be held at the University of Tokyo. Upon arriving, I pretty much immediately headed off to Kyoto for the annual conference of the Japan Society of Image Arts and Sciences (Nihon Eizo Gakkai), the main academic society doing film studies in Japan. This year's event was hosted by Kyoto Seika University. It was like every other JASIAS meeting: a number of misses, but some good papers by young scholars. Since Kyoto was the "Hollywood of the East," hosting many of the film studios that made the great jidaigeki movies, I always check out something film related whenever I visit. Because my hotel was on Kawaramachi, I went out back to Shinkyogoku, which was the old movie theater district, to search out ancient theaters. 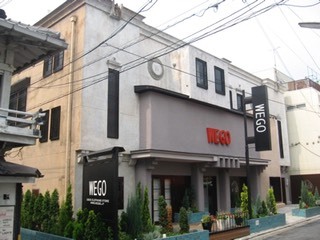 I noticed that the Yachiyo-kan, an Art Deco theater from the 1920s, has been renovated into a used-clothing store. Given how insistent much of Japan is on destroying its cinematic architectural history, it was at least nice to see the building is not completely gone. Here's a site in Japanese that introduces it during its last years as a pink film theater.